Sweet kernels of corn baked in a buttery milk sauce transform into a fabulous pudding that will complement most any meal! 18.2% Vitamin A, 17.5% Vitamin C, 10% Calcium, 8.7% Iron. Based on 6 servings. 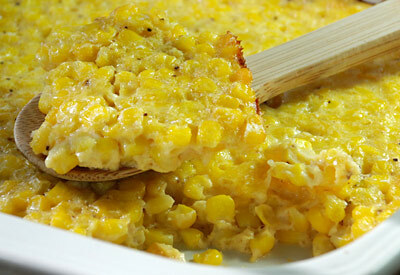 Prepared using no added salt frozen corn, fat free evaporated milk and unsalted butter. Mix all ingredients together in a bowl. Pour into a greased 9x9- inch baking dish. Bake at 350 degrees F for 45 minutes, until firm. Serve hot.